Properties are listed by price in order from high to low. You may change your sort order below, and you can refine your search by checking or unchecking the search criteria (or sliding the criteria bar) along the right side of this page. Landgrove Mountain Retreat – Sited on 31 spectacular acres in Landgrove, this special property offers privacy, comfortable living spaces and a recreational base for all generations. There are million-dollar views looking towards Stratton and Bromley; trails for walking, skiing or riding crisscross the land; and the lawn areas and a bocce court will provide hours of fun for all ages. A large pond is enjoyed for skating, swimming or floating on a lazy afternoon and is flanked by a small cabin (sleeps 4, heated with woodstove) that has been adored by the owners for overnight stays, cocktails on the screened-in cabin porch on a summer evening, and roasting marshmallows after an ice-skating party. The timber-frame house was built in 1982 by Vermont Timber Works using maple and pine from the property, and expanded in 1996. With 4BR/4BA, there are spacious living areas with views in every direction and several “bonus” rooms including an upper level living area in one section of the house and the so-called “shouting room” where the children can gather to play and shout in another section of the house. This property also includes a 2-car attached garage and a 2-story garage and equipment barn for tools and toys. Centrally-located with access to some of the area’s prettiest villages and the Green Mountain National Forest, you will be skiing at southern Vermont’s best mountains in just minutes, enjoying world-class theater and music in Weston, and shopping and fine dining options are nearby. Additional information and photographs are available at https://www.vermonttimberworks.com/our-work/timberframehomes/timber-frame-retreat-in-vermont/. Contact Claudia Harris at (802)824-3176 or claudia@mmmrealestate.com for more information. Skiers and outdoor enthusiasts take note: this bright, fun, spacious contemporary is conveniently located in the tri-mountain town of Londonderry and equidistant to Stratton, Okemo, Bromely ski areas (and rising star Magic Mountain too! ), with Lowell Lake just a couple of miles away and the Green Mountain National Forest nearby. The house is the perfect spot to call your Home in the Mountains and features a highly functional layout with comfortable rooms to entertain family and friends. Highlights include two stunning stone fireplaces, large open eat-in kitchen, family rooms, spa and sauna, ski and equipment storage with laundry, and five large bedrooms including a large master suite with fireplace and a junior master suite. There are 40+ acres, beautiful western views (amazing sunsets!) and lots of outdoor areas to enjoy (deck, patio, screened porch) and a hot tub and spa room. A detached garage with storage above compliments the attached, heated two-car garage with direct entry to the house. The property is enrolled in Vermont's land-use management program and future owners can proudly continue wise land stewardship and realize a reduction in property taxes. Mountain Pond Farm is a unique and special offering with a handsome country contemporary and 47+ acres of pasture/meadows, beautiful woods with an old trail system, swimming pond and an impressive barn that was once used to raise alpacas on this hillside retreat. The house was built in 1986 by well-respected local builders and features one-level living with pretty views and an open floor plan, 3BR/3BA, living room with brick hearth and fireplace, and there are several comfortable and spacious "bonus" areas including a large, bright office/living room off the master suite, a cozy den and a loft. The detached barn has water and electricity, there is a fully-fenced backyard for pets, and the pasture has a run-in shed. The 47 acres is actually 10 separate parcels, with the house and barn on a 7.7+/- acre parcel with several other lots that could possibly be developed or split off and sold in the future. Craftsman Style Cape - Immaculate and Ready for You! Situated on a quiet country road, this beautiful custom-built home is centrally-located with skiing, shopping, restaurants, golf, lakes and trails just minutes away. The house offers an open floor plan, comfortable living areas, a great layout and tons of extra space for storage and hobbies. Highlights include a stunning fieldstone fireplace, built-ins galore, two wood stoves for efficiency and comfort, Yellow Pine wood floors throughout, and tons of natural light. The updated and immaculate country kitchen has stainless steel appliances, including a dual-fuel convection range and the dining area just off the kitchen has bay windows and access to the library/office. From there you enter the 22'x30'+/- Great Room, where you can sit by the fire and entertain friends and family. The Great Room has beautifully-crafted built-ins, wet bar and beverage fridge and there is even a Murphy bed for extra guests! To enjoy the outdoors, you can rest along the long, sunny deck that spans the front of the house, dine in the screened porch and/or congregate on the gorgeous stone patio at the rear off the Great Room. An attached two-car garage, plus the detached oversized barn/garage/workshop have plenty of storage and 4.9+/- acres complete the picture! Come take a look. Ready to Build? Enjoy these Panoramic Views! With views in almost any direction, this magnificent parcel offers 61+/- acres of perfection! Approximately 10 acres is a large, sunny, open meadow and the remaining 50 acres is beautifully wooded and threaded with a network of old logging roads (perfect for hiking, snowshoeing, riding, snowmobiling - whatever you desire!). Two potential building sites have been identified - take your pick of building in the big, sunny meadow with views to the north and east or a little further away on a plateau in the woods with the potential for views to the south and towards Stratton. Soils tests at both spots indicate it is appropriate for one 4BR home. Electric is at the roadside and soils test indicate 4 BR house. You'll be right in the middle of an active and fun community - skiing at Stratton is about 15 minutes drive, Magic Mountain is 3 miles, Lowell Lake State Park is 3.5 miles and shops and restaurants in Londonderry are just minutes away. Totally private residence on 16+ very private acres in Landgrove. The original structure is a geodesic dome that was built by the current owner in the vein of Buckminster Fuller. Greatly expanded, the house is now light & bright w/multiple living spaces (two living rooms, screened three-season porch), large kitchen w/custom cherry woodwork and stainless appliances & master bedroom suite. Stunning views from the house, decks and lots of storage space for toys and hobbies make this unique property a must see. Detached 2-story barn/garage completes this picture-perfect property. Do you dream of a quiet and simple life in the country? Come take a look at this charming antique farmhouse on 28 acres located just north of Weston village and less than one mile from the beautiful Weston Priory (Benedictine Monastery). There are wood floors throughout, and several fireplaces and stoves to keep you warm and toasty on frosty winter nights. Original architectural features abound, but there have also been lots of recent updates - new standing seam metal roof (2013), new furnace (2014) - that make this a solid investment for your future in Vermont. A large barn across the road houses your tools (and toys), there is a small pond just below the house and the 28 acres is enrolled in Vermont's Current Use program and the current owners enjoy a significant tax savings as a result. 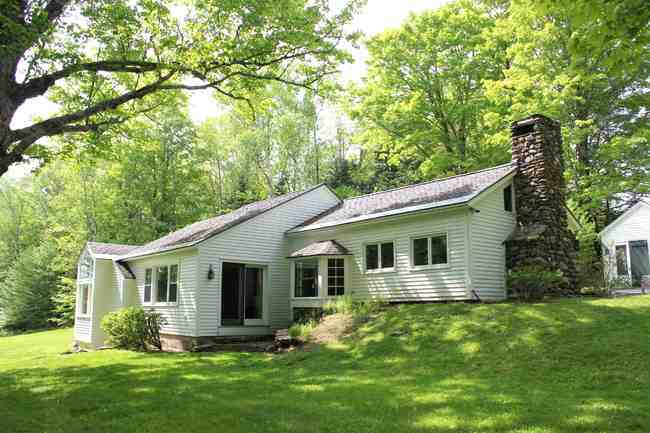 Well-maintained 3BR/2.5 BA country contemporary with great light (tons of windows!) and great living spaces. An open floor plan on the main level features a large updated kitchen, living/dining room with vaulted ceiling, mudroom entry with laundry, master bedroom suite and a powder room. Upstairs are two large bedrooms, reading/office/play nooks and a full bath. The lower level is unfinished but there is space and rough-ins for a family room with kitchenette (or bar? ), bathroom and workshop plus the well-organized utility room. Highlights include hardwood floors, radiant heat on two levels, privacy, storage shed and your own babbling brook. The house is centrally located and just minutes to skiing at Okemo, restaurants and shops in Ludlow or Weston village for theater, music, summer rec. Flood Brook school for K-8 and School Choice to high school. With an eye to country-casual flair and decor, this home is neat as a pin and ready for its next owners to enjoy as a primary or vacation home. The main living area on the upper level and features a big open kitchen and dining area with the living room to one side, and three bedrooms including a master suite with private bath and walk-in closet. The ground-level entry is convenient with a big mudroom with built-ins and storage, spacious family room heated with a pellet store, laundry room with tons of storage and a large workshop in the utility room. Lots of upgrades and improvements: refinished wood floors, updated bathrooms, wrought-iron hardware (by the owners), new slider to deck, and more. The beautiful barn has an oversized one-car garage but is currently used as a blacksmithing shop and forge. Close to town, school (school choice for HS), medical center, and four-season recreation is minutes away. Located in the heart of the village, this beautiful historic village home has been completely renovated with grace, charm and historical accuracy. There are 3BR/2BA and a lower level guest suite (or office, home gym or business space). It is absolutely perfect in every way with period details at every turn and special features include pretty perennial gardens, two stone patios (one in front and one in back), and a screened summer room for al fresco dining in the warmer months. There is ample storage and a large workshop in the beautiful attached antique barn. Weston is home to the much respected Weston Playhouse and summer theater, music, the library, post office, shops and restaurants are all a short walk away. Although it is currently used as a residence only, the property also offers two potential business or retail spaces (approx 36x33 and 22x11). Contemporary home located on a dead end road in a lovely small village. Peaceful and quiet. Located on a wooded 2 acre lot with a front and back deck This 3 bedroom home offers privacy in a great location. 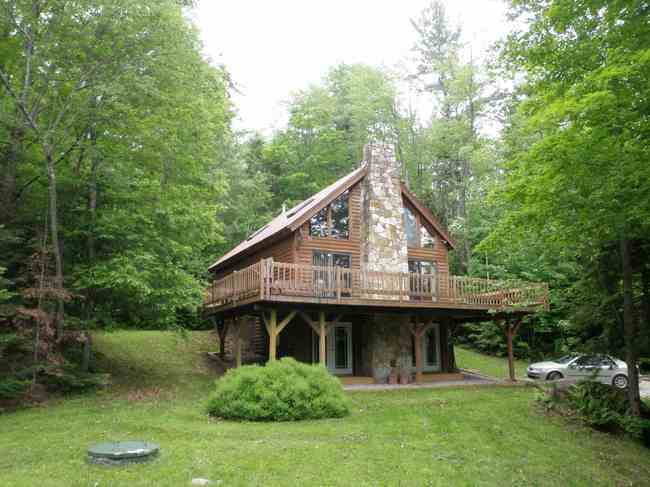 It has two wood stoves and a one car garage with interior stairs. Kitchen is open to the dining area. Washer and dryer are on the main floor. House is in an estate and being sold in "as is condition" and is priced accordingly. With BIG panoramic views looking south towards Stratton, this 5+ acre parcel is cleared and awaiting your arrival and the construction of your dream house! All day sun and a large, open building site, meadow, small stream. Electric is at the roadside and soils test indicate 4 BR house. You'll be right in the middle of an active and fun community - skiing at Stratton is about 15 minutes drive, Magic Mountain is 3 miles, Lowell Lake State Park is 3.5 miles and shops and restaurants in Londonderry are just minutes away. Part of the Woodcock Farm community, this lovely 2.3+/- acre parcel is located at the end of a short lane in a highly-desired part of Weston. The lot is the last vacant spot in the neighborhood and is all ready for you to build your dream house. There will be nice seasonal views with some clearing and the land faces south and offers great light and a beautiful sense of place! There is underground power at the site, your driveway access will be off the quiet cul-de-sac, a drilled well is in place, and the septic system is in place - all you have to do is install the tank and connect it to the existing system (this is a HUGE savings when comparing this building lot to others in the area). Located in the beautiful village of Landgrove, this expanded country cottage features comfortable living spaces and beautiful outdoor areas and is the perfect blend of country casual and sophisticated finishes. The house has three bedrooms (sleeps 6), two bathrooms, a family/dining room off the remodeled kitchen and a large living room that is reminiscent of an old Adirondack Lodge with a fieldstone hearth and gas fireplace. An adorable unfurnished “tiny cottage” adjacent to the house will let your imagination wander - studio, home office, workshop, me-space? A pretty stone patio, winter views, natural pond and a post and beam garage/barn complete the package. This property is available for the 2019/2020 winter season.